This layered outfit is my love letter to the bands and their muses of the 60’s and 70’s! I was never one to get too caught up in what was popular in the moment. Trends and of-the-moment looks are fun to play mix and match with, but I have always marched to the beat of my own drummer (as my Dad would say) and when it comes to style I have always stuck with what I like, whether it’s “in” or not. That, I believe is where trends are born. It is those who bend the rules, push the boundaries and take risks that become the trend setters. Above all else trend setters do what they love, not what they think others will love. It’s the bold confidence of it that makes people stop and take note. Truth be told, this is my go-to look, I LOVE IT! So you may see different variations on this theme pop up on the blog now and again. 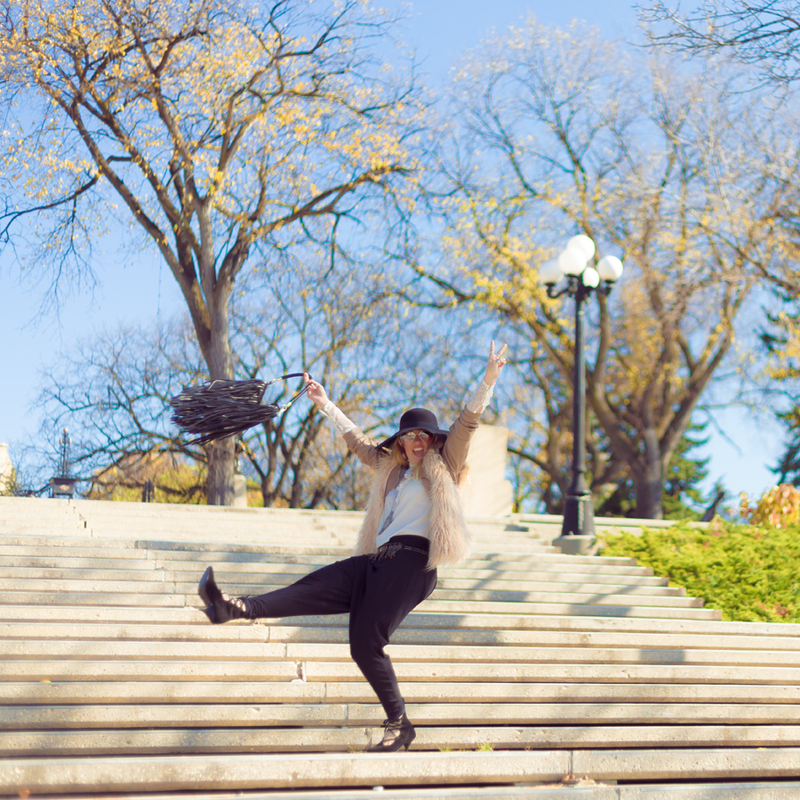 This look is as “me” as it gets, which is why I chose to show off some of my beautiful home city of Winnipeg in this shoot. This look is a little bit bohemian, rock n roll, urban and timeless with a dash of ethnic flavour. I am a bohemian through and through, but I am also a chameleon and I love to adapt and change with my surroundings. Fashion is supposed to be fun after all! I have always been drawn to the culture of the late 60’s with it’s freedom loving hippies, inspired bohemian fashion, Middle-Eastern and Indian influences and of course, the music! I grew up on Led Zeppelin, Janis Joplin, Simon and Garfunkel, David Bowie and Fleetwood Mac to name a few. There was a time when I felt I was born in the wrong era and I had many a teenage daydream about running off with my favourite band to live a life of hotel parties, glamour, rock n roll and the open road. I am inspired by music, musicians, artists and their muses and I have found my life touched by them because of it. Now that I’m an adult my dreams have shifted and focused, but the essence of them has remained. Now I dream of styling bands and music artists and being a part of creating the image that they so desire, and I’ve been fortunate enough to do that on a few occasions. She is with the band, but not in the way you think. She has inspired and influenced them and as a result, she’s a part of them and her essence is carried with them and shared with the world. Faux-fur vest from American Eagle Outfitters, Middle-Eastern inspired harem pants from American Apparel, black felt hat and fringe bag from H&M, rings have been collected over many years from festivals, street vendors, thrift shops and while travelling abroad. ← Guests of Fashion Contest Winner! I love hearing your stories!